Expect to have a full mouth series of x-rays and a thorough examination during your first visit. Dr. Williams considers the first visit to be the most important one. He will take his time with you to establish a personal relationship as it is the foundation in tailoring a treatment plan that will fit your dental needs within your expectations and budget. After answering all your questions you will be presented with a written treatment plan that includes all the costs involved and the portion to be paid by your insurance, if available. Including general prophylaxis and Periodontal scaling and root planning if needed. Patients who keep up with their cleanings usually need prophylaxis 2 times a year. People who have not seen a dentist for a while will probably need more attention which might include general debridement of all the deposits on their teeth above the gum line and then they may need further cleanings under the gum line, what is known as deep cleaning. More advanced cases might require referrals to a periodontist.. Cosmetic dentistry is all about treatment planning to reach a goal of what is expected by the patient and what is actually possible to acomplish. The first requirement is to bring the mouth to optimum health by fixing any cavities or broken teeth and periodontal care and even pulling any hopeless teeth. The second phase that we recommend is teeth whitening which may include a one hour in office whitening session or take home kits. If you are satisfied with the outcome, stop, you're done. The third phase might involve moving teeth through orthodontics or changing their colors and shape through dental Veneers or crowns or dentures. Veneers are similar to the fake nails that some women use on their fimger tips. They are made of porcelain and are bonded to the surface of the teeth and can change your smile completely with minimum tooth reduction without the need for numbing in most cases. Crowns are the treatment of choice for broken teeth or teeth that do not have enough structure to hold a filling. A crown will encircle the tooth and protect it from further fracture. 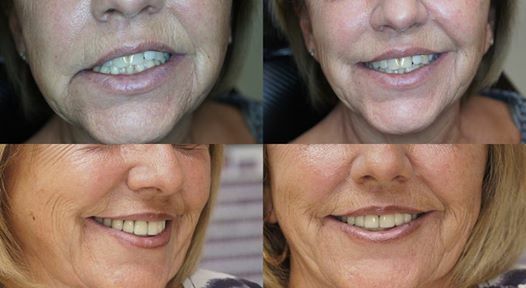 A bridge is a way to replace missing teeth. It usually involves a crown on a tooth in front of the missing space and one behind it carrying a fake tooth between them and is glued permanantly. We utilize all available materials to construct our crowns and bridges including gold and traditional crowns for maximum strength to the more esthetic all porcelain crowns. This will be tailored to your oral condition and needs and we do not charge higher fees for the more cosmetic crowns. We understand how difficult it is to chew and function when teeth are missing. Our cosmetic dentures and partials can provide you with comfort and chewing ability without compromising the natural looks.We use the best available materials. We do almost all extractions in office. We only refer complicated procedures that require specialized training to the local surgeon. These may include medically compromised patients and wisdom teeth that require deep sedation or general anasthesia. These are just some of the services we offer. Please feel free to contact us if you have any questions.